This Chandra image shows gravitationally-bound, hot gas enveloping the distant galaxy known as 3C294. This X-ray emission is considered a signature for an extremely massive cluster of galaxies – one of the largest known structures in the universe. Astronomers believe they have captured the cluster surrounding 3C294 at a time when the universe was only 20 percent of its current age. This faraway cluster may therefore have important implications for the understanding how the universe evolved from a much earlier epoch. Chandra's image reveals an hourglass-shaped region of X rays surrounding the previously known radio galaxy (seen as the blue central object). The intensity of the X-ray emission is shown in red coloring for low-intensity X rays, green for intermediate, and blue for the highest observed energies. The vast clouds of hot gas that surround clusters of galaxies are thought to be heated by the collapse toward the center of the cluster. Until Chandra, X-ray telescopes have not had the needed sensitivity to identify this signature X-ray emission of such distant galaxy clusters. 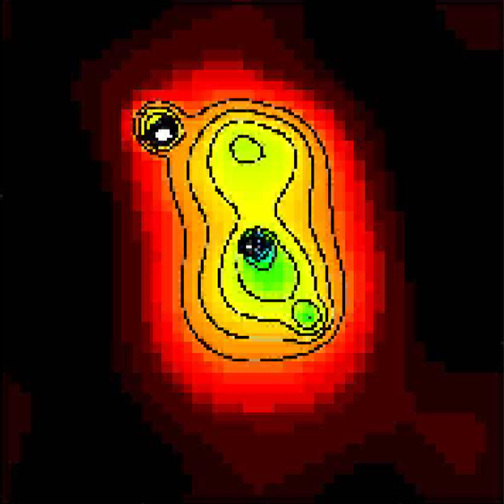 Chandra observed 3C294 for 5.4 hours on October 29, 2000, with the Advanced CCD Imaging Spectrometer. Coordinates (J2000) RA 14h 06m 44.10s | Dec +34° 11' 24.80"